The other difficult part is photographing them before eating them, I was lucky to catch this one after having started to eat it already! Which gives us the opportunity to look inside and notice how fluffy it is on the inside. 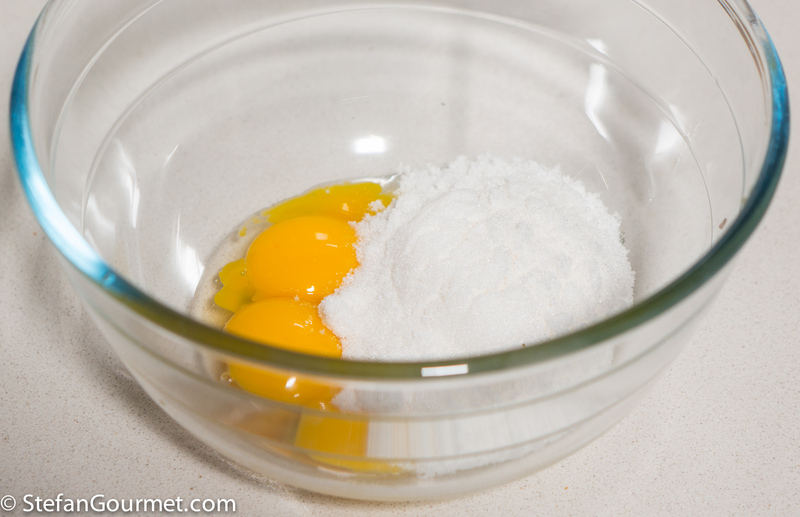 Put 3 eggs yolks in a large bowl with 90 grams of sugar. 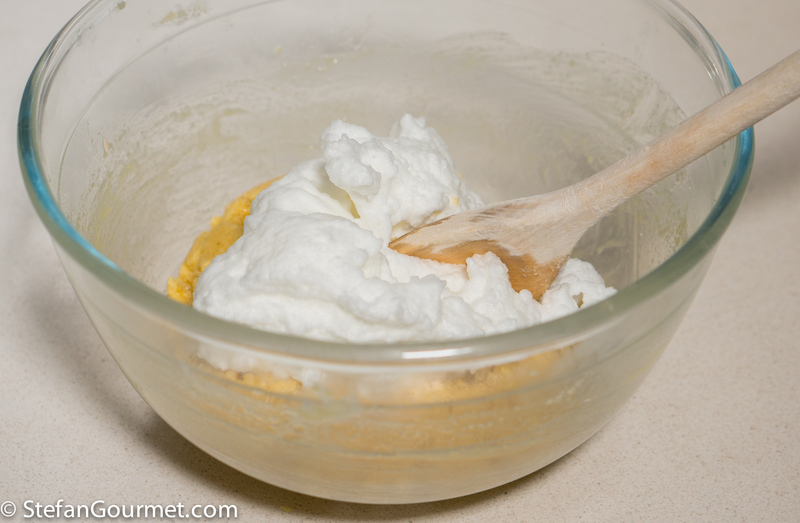 Whisk until pale and creamy. 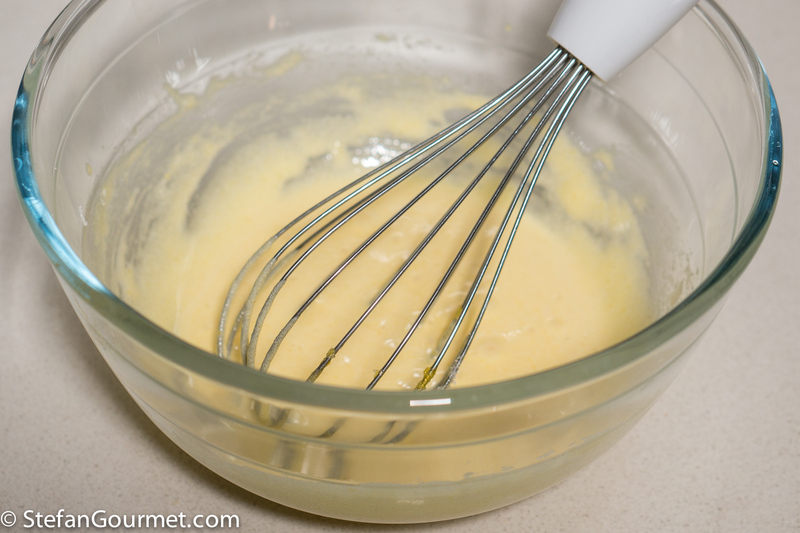 The change of color should be quite clear, but you can also check whether the mixture drops from the whisk ‘in ribbons’ when you lift the whisk. 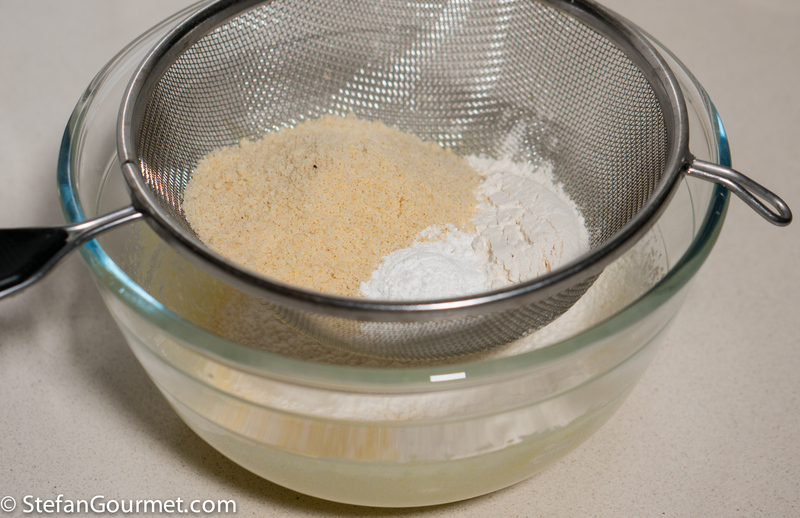 Sieve 45 grams almond flour, 45 grams cake flour, and 1 teaspoon baking powder into the egg yolk and sugar mixture. 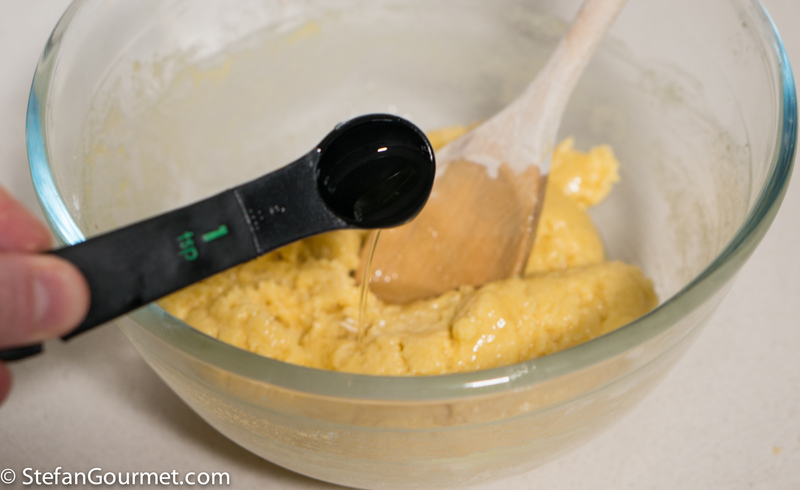 Stir with a wooden spoon to incorporate the butter. 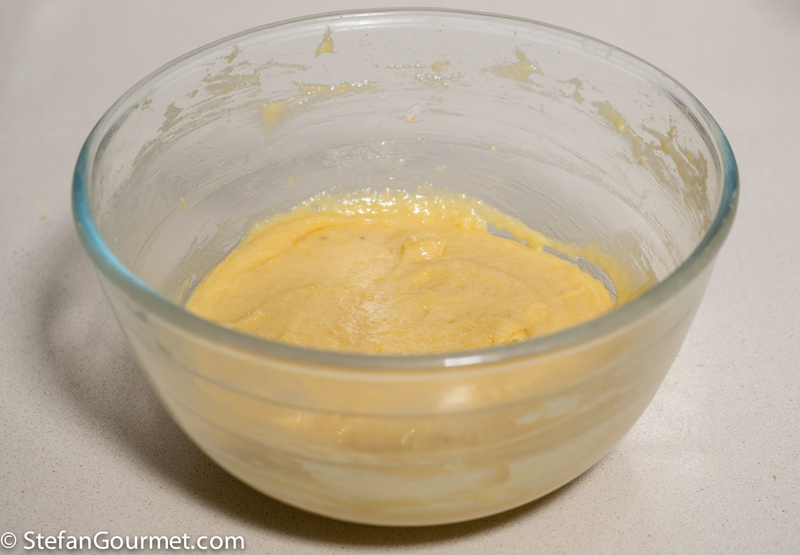 Add a teaspoon of almond extract and stir to incorporate. 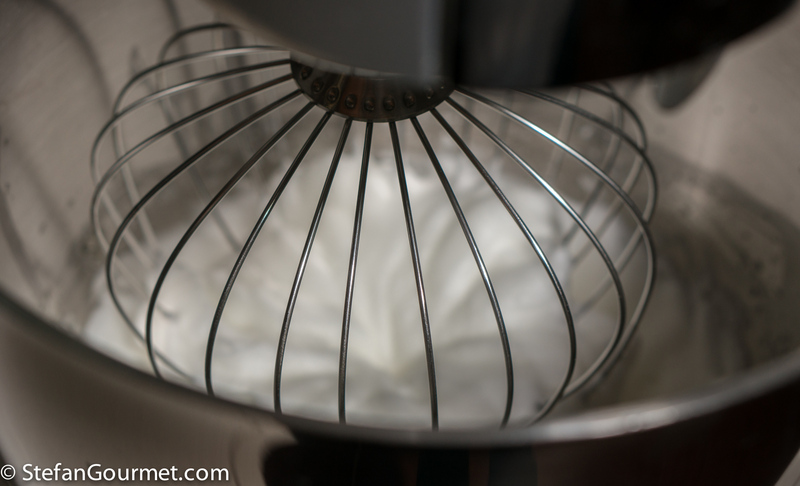 Whisk 3 egg whites with a pinch of salt until the ‘soft peaks’ stage (it will look like snow). 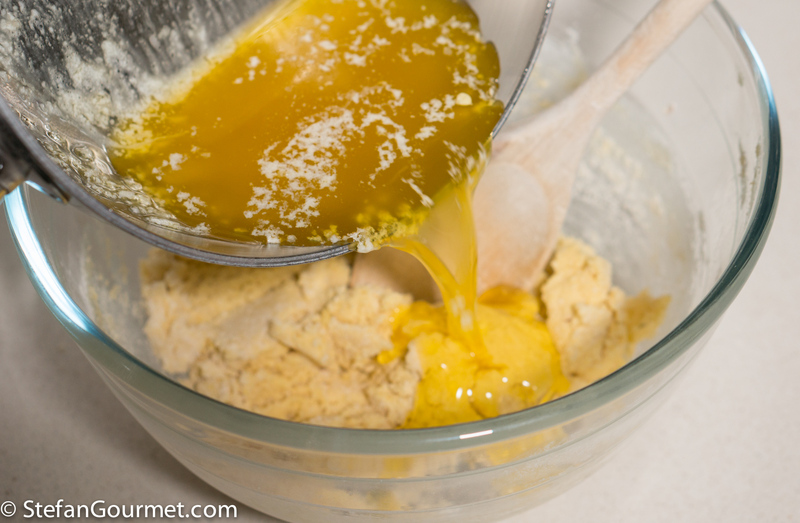 Gently fold the egg whites into the batter in three or four additions, working from the bottom to keep the mixture as airy as possible. 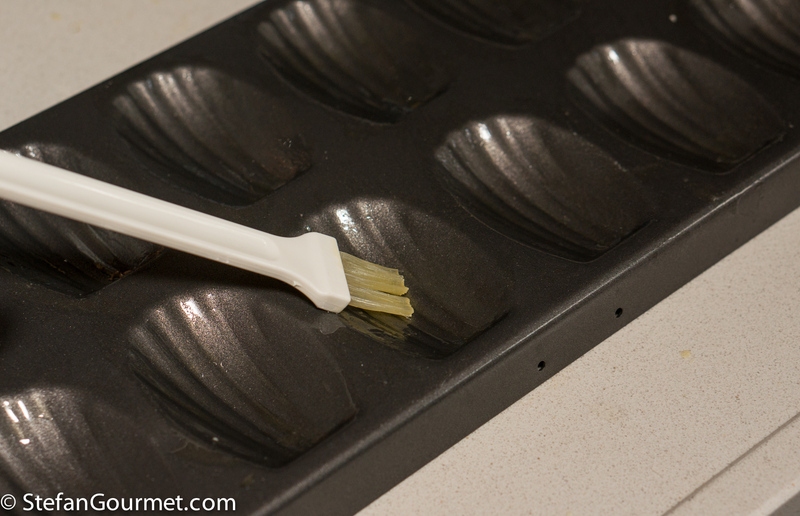 You can now cover and refrigerate the batter until later. 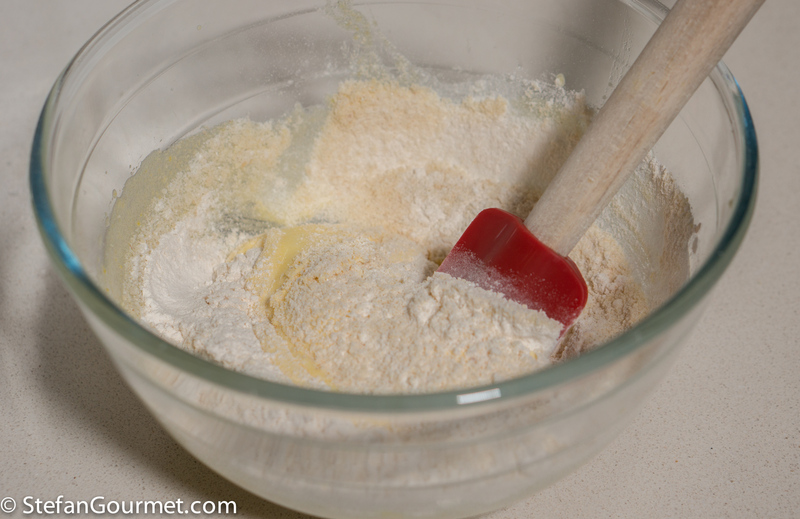 Prepare the madeleine pan by greasing with melted butter and dusting with flour. When it is time to bake, preheat the oven to 200C/400F. 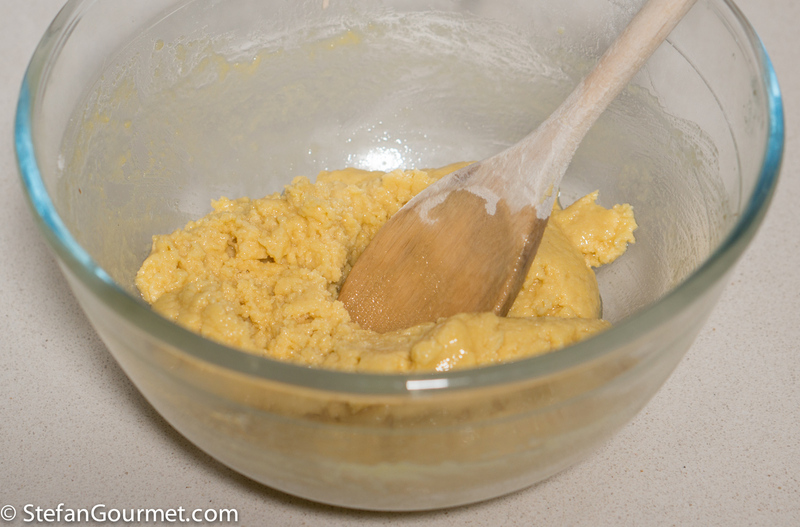 Spoon the batter into the prepared pan. 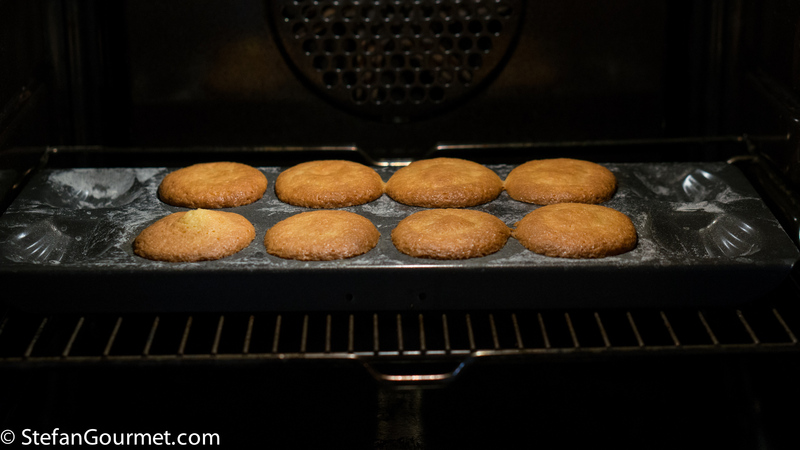 Bake for 10 minutes at 200C/400F or until golden brown (and a toothpick comes out clean when inserted into the thickest part of a madeleine). Serve at once while they are still warm. If your pan is non-stick and you greased it properly, they should fall right out when you shake the pan a little. 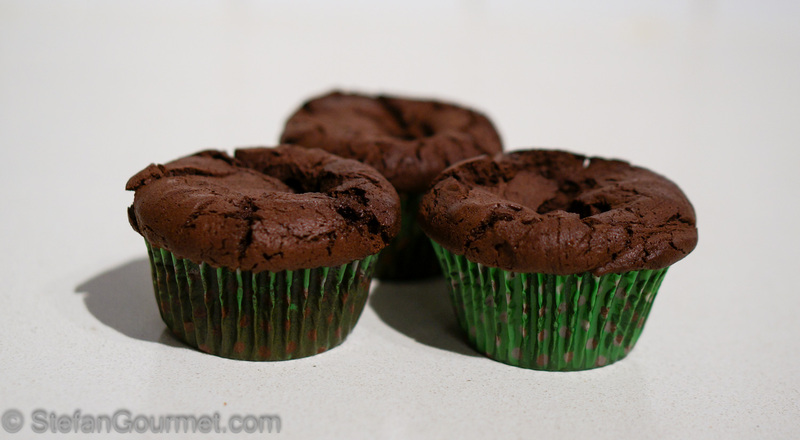 If you like chocolate, you will love these flourless chocolate muffins. You could even serve them warm as a dessert as ‘lava’ muffins. 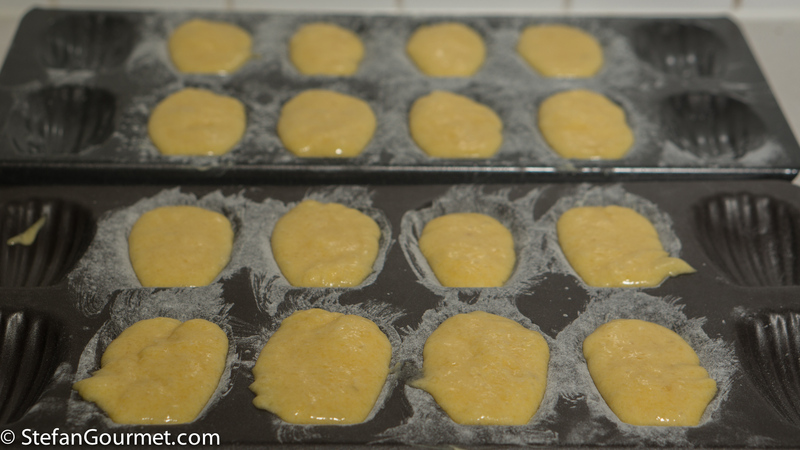 The last time I was in France, I thought of buying a Madeleine tin and then thought of buying a silicon one. In the end, I bought neither and regretted it. You have them just about perfect. Non so se le farò mai, ma bellissime!